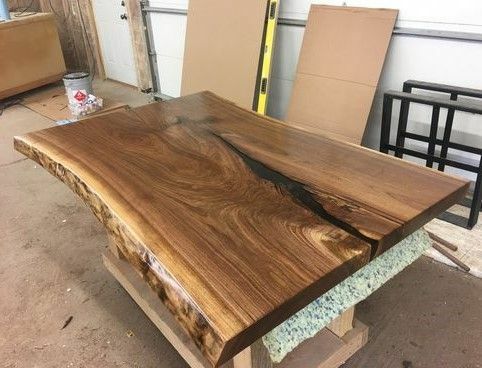 A question I get hit with a lot is how to keep a live edge slab from warping, or how to stop one after it has started warping. I decided to make a video explaining the wood science behind it and what you have to do. 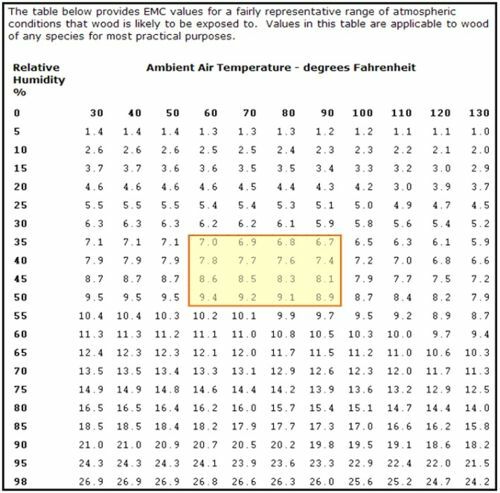 Heres the chart that tells you what the moisture content of your wood will be for the temperature and humidity of your home or woodshop. Peeps have told me to cut a big groove down the underside to allow expansion etc what your views? That’s absurd. In no way shape or form does cutting a groove in the bottom help wood dry, allow it to expand/contract, or keep it dimensionally stable. People cut kerfs in the bottom of their tables because the wood isn’t dry and it’s warping and they’re trying to bend it back flat. It’s no different than all the people routing in giant steel channels in the bottom of their slabs. Let the dang wood dry and reach equilibrium with the temperature and humidity, and it won’t warp. It’s that simple. Here’s the bottom of one of my tables. Do you see any grooves or metal plates under it? Consider this – If I carve a deep relief design into the surface of a slab (more that half the overall thickness), the surface area will be considerably greater than the flat opposite side. The rate of moisture loss will also be greater. If I cut grooves into the opposite side, the surface area can be closer to equal. To be clear, I don’t carve large reliefs in green wood. Likewise, I have had no problems with warping or cracking. To be clear, I don t carve large reliefs in green wood. Likewise, I have had no problems with warping or cracking. I have no idea where you came up with any of that but the speed at which wood dries has nothing to do with the surface area. Kiln schedules and drying rates are determined by the thickness of wood, not the surface area. If you remove a part of a slab by carving it out, then obviously the thinner part will dry and reach equilibrium faster because there are fewer cells to lose moisture, and less distance for moisture in the cell walls to travel to the surface to evaporate off. Its a well known fact that thinner wood dries faster than thicker wood. But to say that you need to equalize the surface area on both sides for drying purposes is bizarre and has no foundation in wood science. I don’t know who gave you that idea, but there’s absolutely no truth to your statement. Great, and very clear, info. I think I got the message: the wood must be dry – and dry means in balance with the humidity in the room. But if I, as you, build the table in wintertime when it’s cold and dry. I think you noted that the humudity in tour shop was all the way down to 15%, and the wood then needed to be all the way down to 4%. So, you build this nice and straight table and everything is good. Or the other way around, you build the table in the summer and winter comes. From the info in the video you are doomed to have warps or cracks with sesonal changes. However, that would not leave your customers very happy – so I guess that is not the case. So what do you do to make the slab stable during sesonal changes? 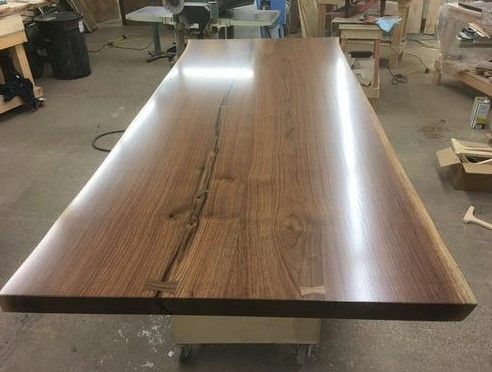 When you build a table in your shop then ship it to the customer who may live in a different area with higher or lower humidity wont the table start to warp?